I embrace all my daughters charming little traits. She can be quirky and funny and endearing yet cheeky all in the same day...sometimes the same hour! 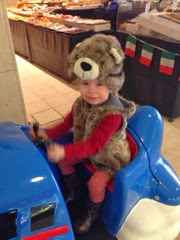 But what I love most (& also worry most about) is her individuality. My girl isn't into princesses or conforming to the ideal Disney girl. 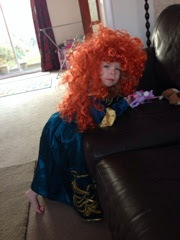 The only concession is Merida from Brave but as Disney princesses go she is the furthest from frothy and pink. The thing that interests my girl about this particular princess is that she carried a bow and arrow! We went into the Disney store, past all that glitters and straight to an intimidating looking bow and arrow set. We didn't buy it but every day she asks for it and every day I tell her 'when you are bigger'. For world book day, I sent her to preschool as Merida but as soon as she arrived she changed into a crocodile costume (much to the delight of the staff) and stayed as a croc the whole session. I'm going to embrace my funny little persons ideas because she may change the world one day.